If it bugs you, it bugs Apple! Schedule pest control services today. Why Choose Apple Pest Control? At Apple, we have the utmost respect for our clients and their homes. You’ll always receive honest pricing and quality work from our team of experienced professionals. It’s just the way we do business. 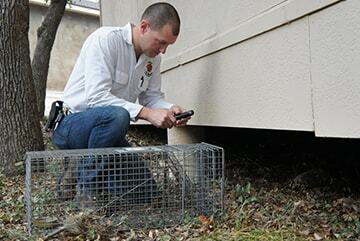 If you’re looking for the pest control San Antonio prefers, don’t hesitate to give our team a call! For over 35 years the Apple family has been Helotes’ and San Antonio’s #1 choice for pest extermination, control and wildlife removal services. You can always depend on us to show up as scheduled and perform our services to the very best of our abilities. Feel free to browse our fantastic reviews online at Angie’s List and more! We are proud to be family owned and operated by the Goodson family since 1984. Owner, Stan Goodson, and his family are native San Antonians, who stay involved in and support their local community. When you choose Apple Pest Control, we promise that our family will take of yours! Apple can take care of any and all of your pest removal needs. From common household pests like mice and cockroaches to larger wildlife, we have you covered. Fill out our contact form to get started! Schedule your appointment or call for a free quote from our team of experienced professionals today. Apple’s professional lawn services target South Texas seasonal lawn care issues specific to San Antonio and Helotes. Our trained professional will analyze your lawn and trees, to identify any areas of concern, and then report their recommendations to you. A healthy yard is only a call away! Apple is proud to be a company that cares. When excluding and removing wildlife from your home or property, we take the well-being of the animal very seriously. For humane raccoon removal, squirrel exclusion, opossum removal, skunk removal and more, call today! Nasty cockroach problem in your home? Call Apple for FAST cockroach extermination today! Stop bed bug infestations in their tracks with help from Apple Pest Control. We’re #1 in town for bed bug removal services! Stop the mosquito madness! Apple Pest Control stops the buzzing and biting so you can get back outside. Looking for a termite treatment company in San Antonio and Helotes? Call Apple Pest Control today! Ants are the #1 pest problem in San Antonio and Helotes. Call Apple today and take back your yard! Looking for a termite treatment company in San Antonio and Helotes? Call Apple today! When it comes to your home and family, you need an extermination company that you can trust. Apple Pest Control is proud to serve San Antonio and the surrounding areas with premium home and commercial pest control. Schedule your services today and let our family take care of yours! Apple Pest Control is rated 5.0 out of 5.0 based on 154 reviews online. Apple Pest Control provides humane wildlife removal and organic pest control services in San Antonio, Helotes, Boerne, New Braunfels, and other surrounding areas. Schedule your services today! Copyright 2019 Apple Pest Control San Antonio & Helotes. All rights reserved. If it bugs you, it bugs Apple! Fill out the form below for fast and friendly pest control services.